Animals suffer from many of the same conditions that affect humans including cataracts, glaucoma, dry eye, corneal ulceration, tumors of the eye, eyelid defects, inflammation, retinal degeneration, and many others. As board-certified veterinary ophthalmologists, we can help. Our goal is to make a precise diagnosis, eliminate pain, and preserve or restore vision. 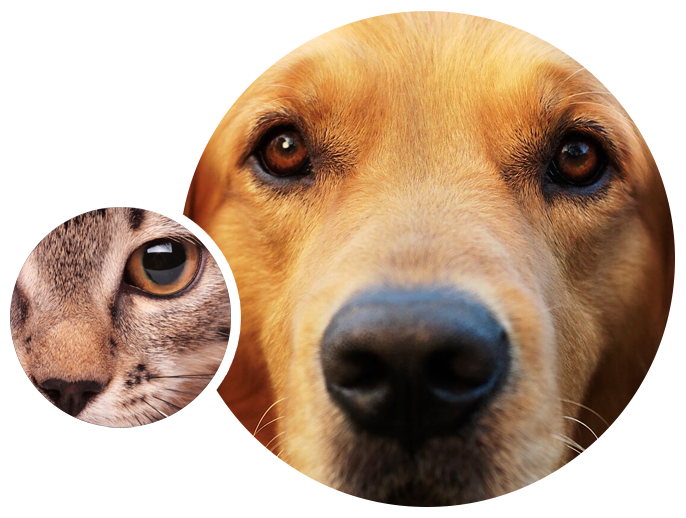 From two convenient locations, the doctors and staff of Animal Eye Care will provide your pet with expert care using state-of-the-art equipment and a healthy dose of compassion. "Dr. Hamilton was great and very helpful with my cat Smokey! Although he is having an unfortunate end, it is great to get a final answer on his condition and it has set my heart at ease. Without Dr. Hamilton, this would not have been possible! Highly Recommended 10+ Stars!!" Our Alaskan husky needed to have an ectopic cilia and cryoepilation due to constant cysts on her left eye from white hairs growing under her eye lid. I was nervous and anxious about the procedure; they took such amazing care of her! She was never left alone and was given lots of loves. The procedure was done in a day and cost a lot less than what I was expecting. We have insurance for both our dogs and sending the paperwork to our insurer was painless. I cannot thank you all enough for helping my puppy get back to her playful, happy self!" "My Chihuahua had an ulcer on his eye that just wasn't healing. We took him here. Dr. Hamilton diagnosed the problem and performed surgery the same day. She has a wonderful bedside manner and was so good with our nervous little pup! The vet techs were all fantastic as well. They were all professional and kind, and treated our dog well. They also very clearly explained the procedure and the home care we'd be doing. They called to check on him after the surgery. He healed well, and is all better now!" "Dr. Patti Smith came highly recommended by two vets that I highly respect. She is very thorough and I immediately felt confident in her. My dog is recovering well from her surgery. The staff is polite and the office is run in a very organized and professional manner."